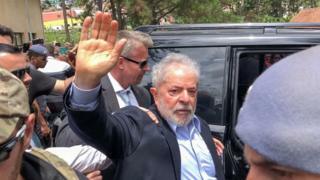 Former Brazilian President Luiz Inácio Lula da Silva is back in prison after being let out to attend his grandson Arthur's funeral. The seven-year-old died of meningitis on Friday. Lula, as he is known, was allowed to go to the burial in São Paulo on Saturday, where supporters gathered to greet him. Lula is serving 12 years in prison on corruption charges. At the funeral, the former president insisted on his innocence. Lula's website said he announced at the funeral that when he met Arthur in heaven, he would prove his innocence after all the bullying that the boy had suffered in school due to his grandfather being in prison. Lula, who claims his conviction was politically motivated, would also prove that the prosecutor and judge who jailed him lied, the note added. But he was convicted for work done on a beachfront property. In February a court doubled Lula's sentence after he was found guilty of benefiting from renovation work from a company implicated in a corruption scandal. Lula had asked permission to attend his brother's funeral in January, but the Brazilian Supreme Court did not grant the request until the funeral was under way. However, Paraná state government said Lula would be allowed to attend Arthur's funeral in São Paulo. The former leader is jailed in a federal prison in Curitiba, the capital of Paraná state. This is his first time out after his conviction last April. Arrangements were made to fly Lula to São Paulo, roughly 340 kilometres (210 miles) away. He was returned to his cell nine hours later, at around 15:45 local time (18:45 GMT). Lula's was the most high-profile conviction from a sprawling anti-corruption investigation known as Operation Car Wash - dubbed "the largest foreign bribery case in history" by the US Department of Justice. His supporters have insisted he is the victim of political persecution, with his left-wing Worker's Party petitioning for his release. President Jair Bolsonaro said he hoped Lula "rots in prison" in a video address in October. His son, Eduardo Bolsonaro, a lawmaker for his father's party, made his feelings about Lula's temporary release clear on Twitter, labelling it "absurd" and stating that "it only allows a high-profile thug to pass himself off as a victim".